Boy Scout Troop 940 presents Flags Over West Chester! Flags Over West Chester is the major fund raising project for Boy Scout Troop 940. Besides helping the Scouts’ raise money for camping expenses, the Project helps build community spirit, patriotism, awareness, leadership, and responsibility while also providing a service to you. In order to perform this service, Troop 940 will place a plastic sleeve into your yard and mark the curb/street at its location. The sleeve will be flush with the ground requiring no maintenance on your part. The sleeve will not interfere with mowing. By participating in Flags Over West Chester, you will help instill values and encourage and support character growth in our Scouts. 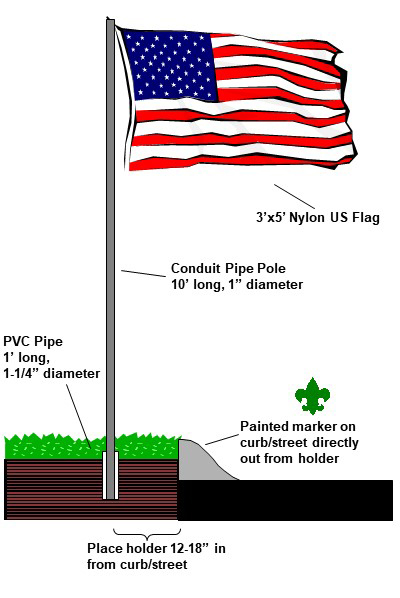 You will also be displaying your patriotism when these flags fly proudly in your neighborhood. Tell your neighbors and help line your street! To start this service at your house and you live in our area, please fill out the form attached and mail it to us! Attached is a link for paypal the added convenience fee for online payers will be $1.50.